While the Carolina Panthers have had the top pick in the NFL Draft sewn up for a few weeks now, the rest of the first round draft picks have been waiting to be filled out. Now that the regular season has ended, the dust is starting to settle and the top picks amongst the non-playoff teams can finally be determined. That means that picks 1-20 in the NFL Draft have been determined, with the final first-round picks to be sorted out based on playoff finish. 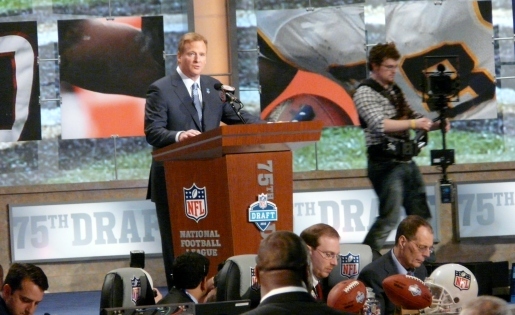 Amazingly enough, the New England Patriots look to be the big winners of this year’s draft without even taking a pick. The team has two first-round draft picks, having captured Oakland’s 17th selection and owning their own to-be-determined first-round pick from their own season finish (thanks to the Richard Seymour trade). Meanwhile, the playoff-bound 7-9 Seattle Seahawks won’t be getting to pick until at least the 21st pick in the draft, or maybe even later if they manage to string together a dumb-luck playoff run of some sort. Isn’t football great?